A WISH COME TRUE Costumes help you Sparkle Smart with a new collection of over 600 show stopping and affordable American made dance costumes. Costumes for ballet, jazz, tap, hip-hop, lyrical, contemporary, even cheer and Christmas, are expertly constructed for unsurpassed fit, comfort and security while performing. Discover quality costumes and service you can trust with A WISH COME TRUE - making costume wishes come true for over 25 years. Contact us for your free catalog. 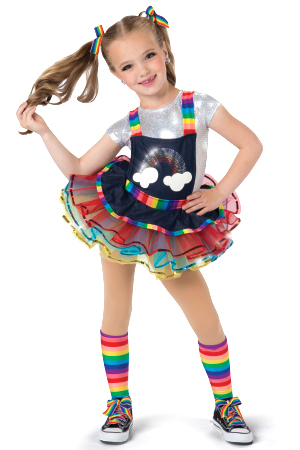 Sequin dot foil lycra, stretch denim and rainbow striped spandex dress with rainbow applique over attached hot pants. Attached sequin trimmed organza tutu. Hair ribbons included, socks sold separately. Flip sequin and striped mesh tunic over attached spandex shelf bra. Faux leather leggings with striped mesh side insets. Headband included. Foil mesh over spandex crop top with attached adjustable straps. Foil mesh split front pants over attached spandex hot pants. Hair scarf included.